MoSe2 nanosheets spheres (MoSe2·NSs) were synthesized directly on the surface of reduced graphene oxide (rGO) nanosheets (MoSe2–rGO) using a simple one-pot hydrothermal approach, which was used for supercapacitor. The synergistic effect of the MoSe2·NSs and the highly conductive rGO network endows the MoSe2–rGO composite excellent electrochemical performance. The effect of the content of graphene in the composite were investigated in details. The optimal electrode exhibits a high specific capacitance of 814.4 F g−1 at 1 A g−1 in 2 M KOH. Moreover, the assembled supercapacitor delivers a high specific capacitance of 215.7 F g−1 at 1 A g−1 and retains 81.7% of the initial capacitance at 10 A g−1 after 5000 cycles. 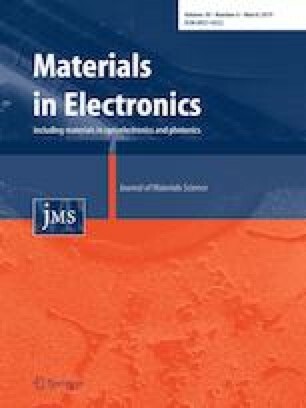 It suggests that it has potential as an electrode material for high-performance electrochemical supercapacitors. The online version of this article ( https://doi.org/10.1007/s10854-019-01174-7) contains supplementary material, which is available to authorized users. This work is supported by the fundamental research foundation for University of Heilongjiang province (Grant No. LGYC2018JQ012), the Innovative Talent Fund of Harbin city (Grant No. 2016RAQXJ185).